Long before it was a hit movie franchise featuring a certain swaggering scallywag with a penchant for eccentric fashions, Pirates of the Caribbean was just a little boat ride at Disneyland. Actually, scratch that—Pirates has never been little: Since it opened in March of 1967, the attraction has consistently been one of the most popular ones in the park. If it’s a pirate’s life for you, too, you’ll enjoy these facts about the classic buccaneers. 1. It was originally a wax museum. 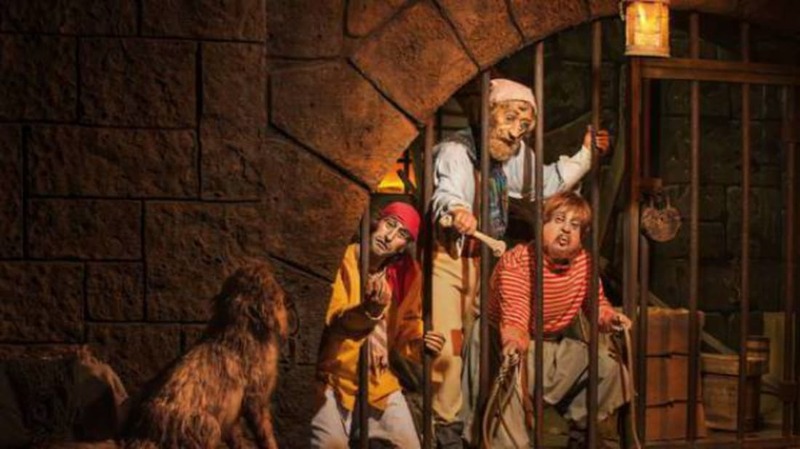 The initial plan was to create a walk-through wax museum where guests could get up close and personal with villains throughout history, though the focus was eventually narrowed to pirates. When Disney's It’s a Small World and Great Moments With Mr. Lincoln animatronics were hugely successful at the 1964 World's Fair, elements of each were incorporated into the ride and the museum idea was scrapped. 2. It took a lot of doubloons to create. The $8 million spent on Pirates of the Caribbean accounted for more than half of the cost to build New Orleans Square, the section of the park that houses the ride. The final bill for New Orleans Square was $15 million—the same cost as the real Louisiana Purchase. And speaking of the Louisiana Purchase, it has another tie to Anaheim’s own little piece of NOLA. The attraction façade was partly inspired by the city's Cabildo building (pictured) where the Louisiana Purchase was signed in 1803. 3. Walt himself supervised the ride creation. To help Walt get the ride experience before the boats were completed, Imagineers rigged a chair up to a dolly and pushed their boss through the attraction at the same approximate speed a boat would pass. Though they thought he would be upset riders couldn’t clearly hear what all of the pirates were saying, Disney was actually delighted. He thought it was like being at a cocktail party, and was pleased that people would be able to pick out something new every time they rode. Sadly, it was the last ride Walt would be hands-on with. He died while it was still being constructed; it opened three months after his death. 4. It almost included a dinner theater. The Blue Bayou restaurant has been housed in the peaceful swamp area at the beginning of the ride since Pirates first opened. Had Disney kept the original plans, however, the eating experience wouldn’t have been so serene. While guests dined on Creole cuisine, pirates would amaze and entertain them. After giving it a dress rehearsal, Walt told his executives that "in this restaurant, the food is going to be the show, along with the atmosphere." 5. Opening day was a spectacle. Disney knew that launching such a ride with a typical ribbon-cutting ceremony would be a huge missed PR opportunity. Instead, he recruited veteran Disney performer Wally Boag to hijack press night on the Sailing Ship Columbia (a boat ride on the Rivers of America) and steer them toward the new ride. Once there, Boag and his pirate crew busted through the fake front doors of the attraction to “open” it. To christen the ride, actress Dorothy Lamour smashed a bottle of water from the Mississippi over an anchor—one rumored to have belonged to the real Jean Lafitte. 6. The scriptwriter had never written a script before. 7. The special effects were a little too real. Disney has always been ahead of its time when it comes to engineering and special effects—and they were certainly ahead of the game when it came to creating fake fire back in 1967. Concerned that people wouldn’t be able to tell reality from fantasy, the Anaheim Fire Chief asked Disney to have an automatic shutoff for it in the event of a real fire [PDF]. 8. There’s a second-floor apartment. The space above Pirates was intended to be a 3000 square-foot apartment for Walt and Roy Disney to use for entertaining or relaxing when they were in the park. Walt died before it was completed, and Roy decided afterward that he didn’t want to use it. The space was used for entertaining VIPs for many years, then operated as an art gallery. These days, it’s home to the “Disneyland Dream Suite,” a tricked-out apartment where guests occasionally get to stay. 9. There are lots of fun details to be on the lookout for. Before you enter the building, be sure to check out the wrought iron fence on the balcony. The stylized initials “WD” and “RD” have been worked into the iron, representing Walt and Roy. When you get inside the ride, see if you can count all of the animatronic figures. You should come up with a total of 122: 68 humans and 54 animals.